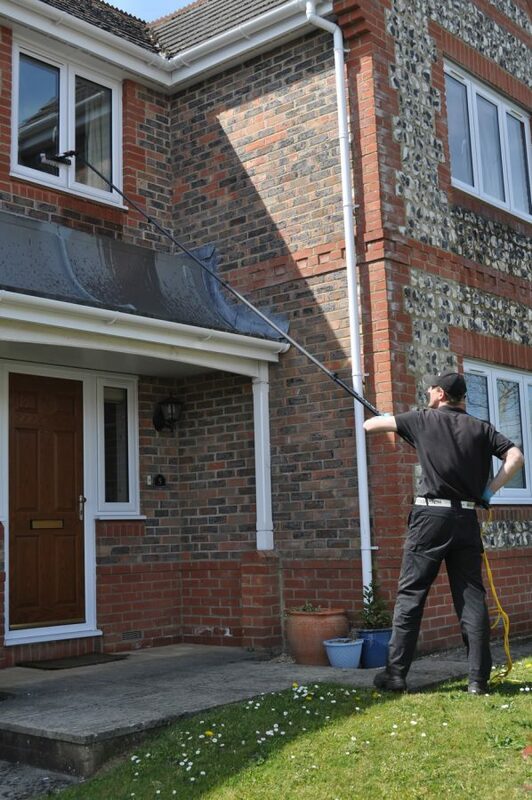 Agleam Windows provides a commercial and domestic window cleaning service in Reading, Newbury, Thatcham, Theale, Kingsclere, Hungerford, Kintbury and Wantage. We also cover all villages in between in North Hampshire, South Oxon & West Berkshire. Our customers choose us because we offer a thorough, professional and courteous service. We have a fixed price menu so generally we can give you a price over the phone and fix a date to clean your windows. We offer a guaranteed window cleaning service. We are professional window cleaners and undertake window cleaning of shops, office blocks, flats and house. The strength of using a water-fed pole system for cleaning windows is that the frames also get cleaned. However there is a problem with this. Unless the frames are perfectly clean, they will drip water onto the glass leaving spots and runs on the windows. The task therefore is to get the frames so clean that any water dripping off will be “pure” and not contaminate the glass. On the first window clean, Agleam Windows of Newbury will scrub the frames hard to remove years of accumulated impurities. We go around every window focusing on getting the frames as clean as possible. Then we go back and clean the glass only. By the time we go back, the frames will no longer be dripping. This is how we can guarantee a top quality finish. You can select a monthly or two monthly window cleaning service to suit your budget or your location. If you are on a busy road, you might prefer a more frequent window clean. Our window cleaning service is insured. We have public liability cover and employer’s liability cover so that your window cleaners can provide peace of mind. We use the water fed-pole window cleaning system. Generally, we can clean every window from the safety of the ground with no fuss and no ladders! In order to leave your windows “agleam”, we clean the window frames sills at the same time. Generally, we will also clean your front door. Thanks for coming today the windows look great, much appreciated as the windows were needing a bit more effort than normal I am sure. Just wanted to say how pleased I was with your cleaning of my Conservatory – it looks brand new again. Delighted too, with all the rest of the window cleaning. Many thanks for doing a great job!! We are delighted.